Attention fellow enophiles! Would you like to enjoy some of the best wines Sonoma has to offer at a substantial discount? You can do just that by purchasing a case or more of futures wines* from the Roche family each year. In addition, your purchase of just one case of our futures wine* entitles you to a complimentary invitation to attend the best end-of-the-summer party in Sonoma – the Roche family’s annual Futures BBQ. Futures are not available for purchase on our online store. Please contact us to join the Futures Program and purchase your Futures selections. Each year in August, during the long-anticipated release of our current vintage, we begin to offer the next year’s vintage at significant savings of up to 55% off the eventual retail price. These futures wines are sold, by definition, while the wines are still aging in the barrel. Therefore, our futures customers purchase these wines months before they are bottled at a significant discount and, then, following the bottling, the customer’s personal account manager will arrange shipment or customer pick up of the wine. We literally have thousands of long-standing customers across the country who have been faithfully purchasing futures wines from the Roche family every year – many since our first release in 1988. Your case(s) purchase of Roche Futures* will also net yourself and a guest an invitation to one of our most anticipated events of the year, the Roche family’s annual Futures BBQ! 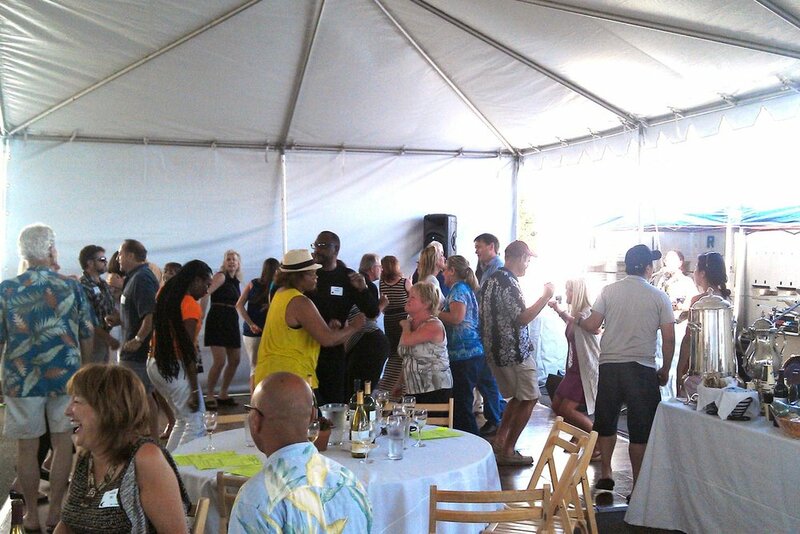 At the catered BBQ lunch you will feast on our famous barbequed noble leg of lamb, dance to live music, have an opportunity to meet and chat with our winemaker and Roche family members, enjoy an amazing party nestled among the family’s scenic Carneros vineyards, and of course…the wine is flowing! The Roche family welcomes you to visit either our downtown Sonoma tasting room or our Carneros winery facility to taste the latest vintage! You are always welcome to stop by our downtown Sonoma tasting room for a barrel tasting (available seasonally). However, we strongly encourage you to make an appointment and arrange a tour with one of our friendly and knowledgeable staff at our Carneros winery facility (reservations required, black out dates apply). Please contact us to schedule your appointment. • 1st Year Futures Customer*: Purchase of one (1) case of Roche futures entitles you to an invitation for you and a guest to our August Futures BBQ and to the Winter Pick Up Party. A five (5) case Roche futures purchase entitles you and a guest to an invitation to our annual Roche Winemaker dinner.